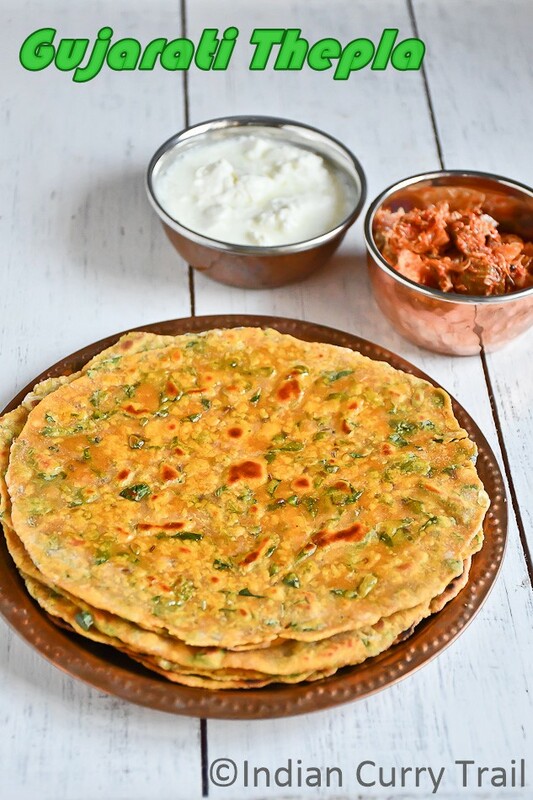 After that, I started to prepare methi thepla at home, whenever I find and buy fresh methi leaves from market. 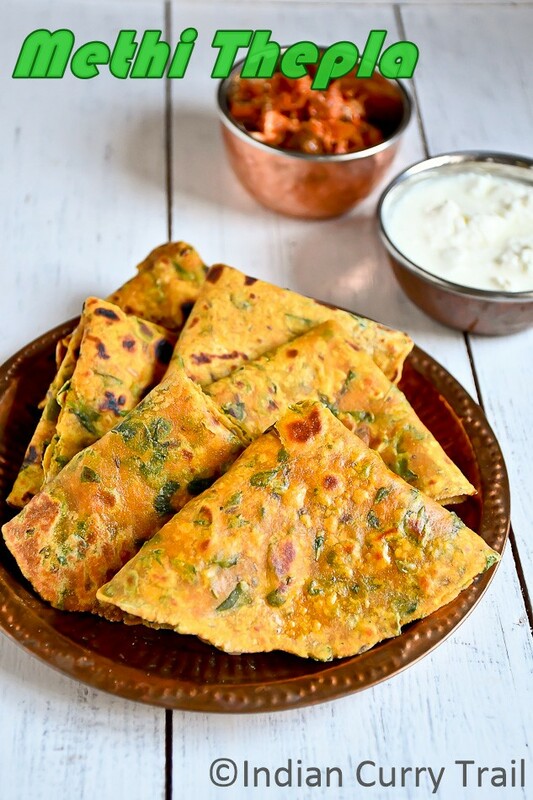 Theplas are easy to make and the one I posted here are prepared using skillet/tawa. You can also deep fry them. Below is the recipe video of the same. Please subscribe and share. 1) Pluck the fengreek leaves from stem and wash well. Pat dry it and chop it finely. 2) In a mixing bowl, add wheat flour, gram flour, fenugreek leaves, green chilli, ginger garlic paste, cumin seeds, ajwain seeds, red chilli powder, turmeric powder and salt. Rub it using your finger tips first before adding Yogurt. 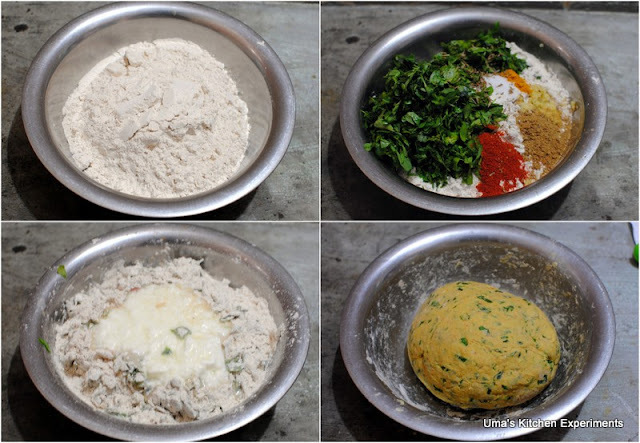 The water content from methi leaves will be absorbed by flour this way. 3) Add yogurt now. Mix again for 1 minute. 4) Add water slowly till you make a tight dough. Knead for few minutes and keep aside 15 minutes. 5) After 15 minutes, divide the dough into equal sized balls. 6) Roll each ball into round disc with the help of flour and using a rolling pin. 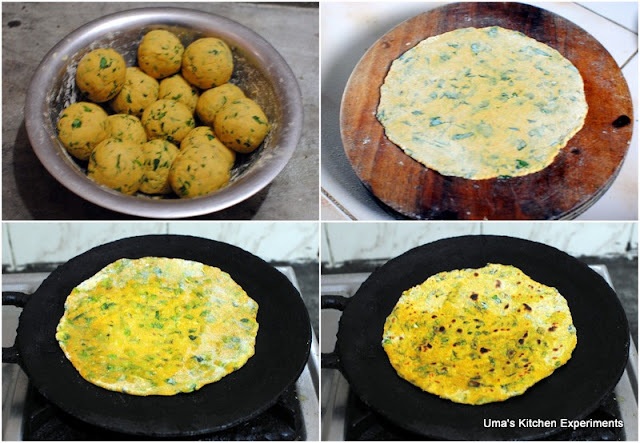 7) Heat skillet / tawa and place the rolled thepla. Coat it with oil or butter. 8) After few seconds, turn to other side using spatula to cook the other side. Repeat this step to cook remaining theplas. 9) Serve hot with pickle and curd. 1) Cumin seeds can be replaced with cumin powder. 2) Change the thickness of the theplas based on your preference. Since we had it immediately after preparing it, I rolled them as thin disc. A healthy dish.. I too never knew Theplas were Gujarathi origin.. Awesome clicks as usual !! 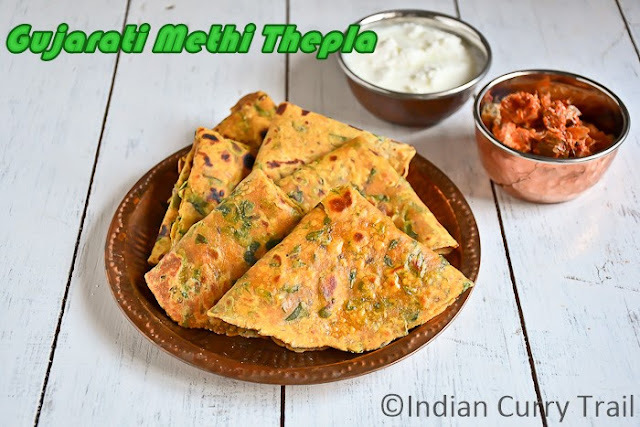 Methi thepla looks awesome! Perfect and loved the way you presented the dish. Healthy and flavorful theplas,perfectly shaped...inviting clicks. Theplas looks wonderful ! Thanks for sharing! Bread looks awesome. Wonderful looking pics. It looks wonderful n lovely clicks!! Looks super delicious. I would love to take some from the plate. Prefectly rolled theplas, i dont mind having anytime. looks very flavorful & delicious! !